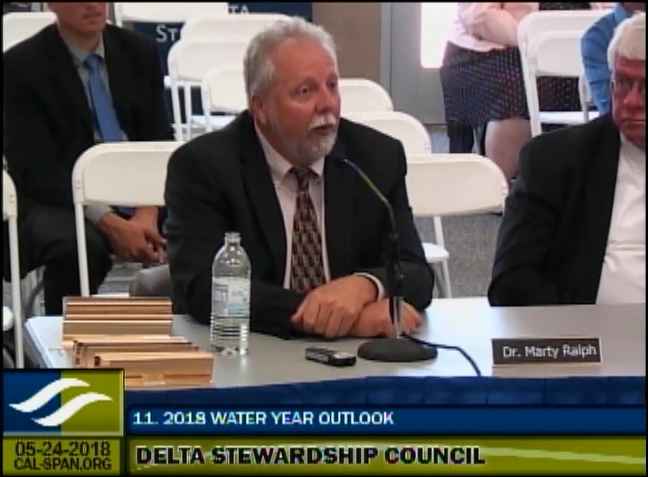 At the May meeting of the Delta Stewardship Council, an agenda item examined the outlook on the water storage and water supply for the remaining water year, as well as how challenges were addressed this past winter. John Leahigh, State Water Project Operations Chief for the Department of Water Resources, discussed how the Department of Water Resources met challenges at Oroville Dam; Steve Ritchie, Assistant General Manager of the Public Utilities Commission, spoke of how the SFPUC dealt with the incident at Moccasin Dam, and Dr. Martin Ralph with the Center for Western Water and Weather Extremes talked about a pilot program, the Forecast-Informed Reservoir Operations Program, which seeks to take advantage of the latest forecasting abilities with the goal of increasing water storage. 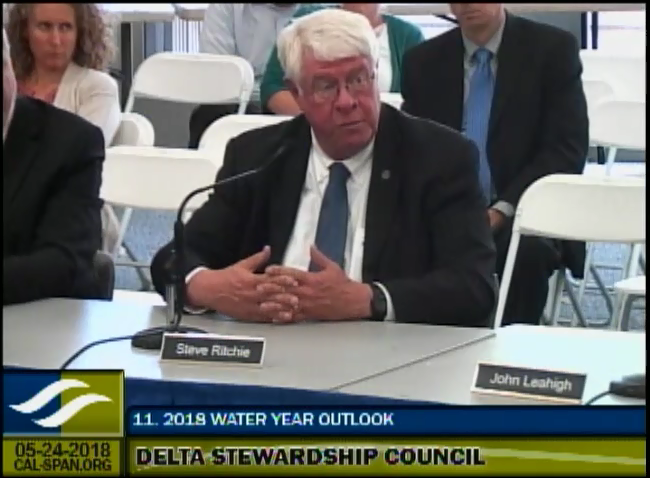 John Leahigh, State Water Project Operations Chief for the Department of Water Resources, began by noting that this year was another example of the whipsaw nature of both the inter-annual and intra-annual aspect of California’s hydrology. The state endured one of the driest four year stretches in the historical record, only to be followed by the wettest year on record, 2017, for the Northern Sierra 8 station. This year, there was very little precipitation for the first few months of the winter, and then a quasi-Miracle March that bailed the state out somewhat; the state is at about 80% of average to date on the Northern Sierra 8-station, he said. Even as late as February, the snowpack was a concern as the water content in the snowpack had been tracking even lower than 2015, which was the lowest snowpack on record (lower, left). The quasi-Miracle March brought the snowpack on April 1st at 50%, so while still one of the lowest on record, the state isn’t in complete dire straits in terms of the outlook for this coming summer, he said. 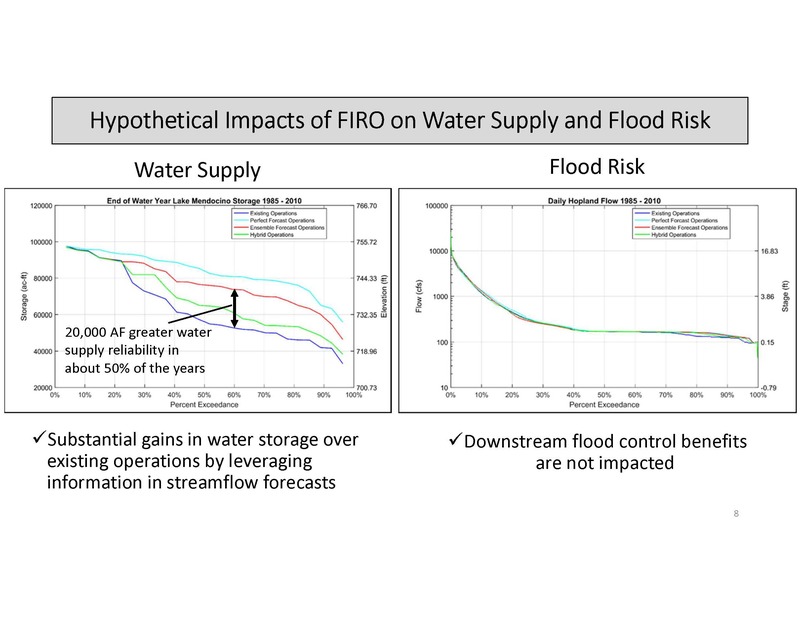 The slide on the upper right shows the two-year cumulative runoff total for the Sacramento Valley. The blue line shows the precipitation events, the biggest one being February 10th, which was the largest event that had occurred in that basin in 20 years. This water year, there was very little activity until late February; there was a rather warm wet atmospheric river system that came in late March; early April was the second one. 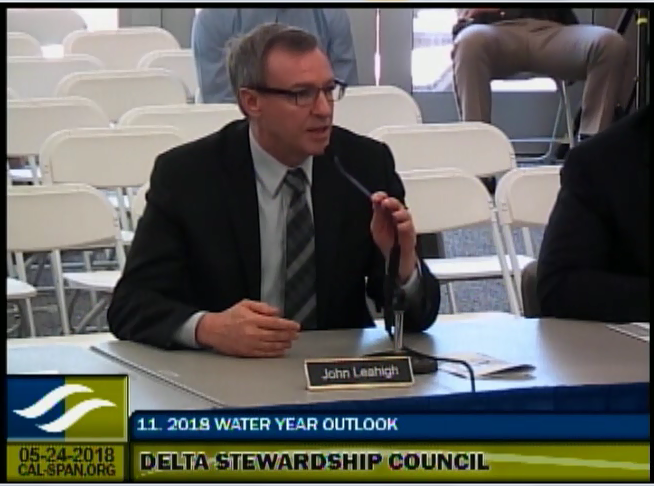 “We were about twice the normal runoff up through last year; this year, we’re coming back down to earth a bit in terms of getting closer to average,” Mr. Leahigh noted. In terms of the US Drought Monitor, prior to 2017, the entire state was in some sort of drought condition; the extremely wet 2017 brought all but about 8% of the state out of drought condition. As a result of the past year being somewhat subpar, about 1/3 of the state is back into some sort of drought as measured by the Drought Monitor, and 2/3rds of the state is abnormally dry. Since 2017 was such a wet year, surface storage across the state is in good shape with most reservoirs sitting above average for this time of year, including most notably Shasta, Folsom, and a lot of the San Joaquin reservoirs, which did very well this spring when the late spring storms coincided with easing of flood control requirements on the reservoirs. 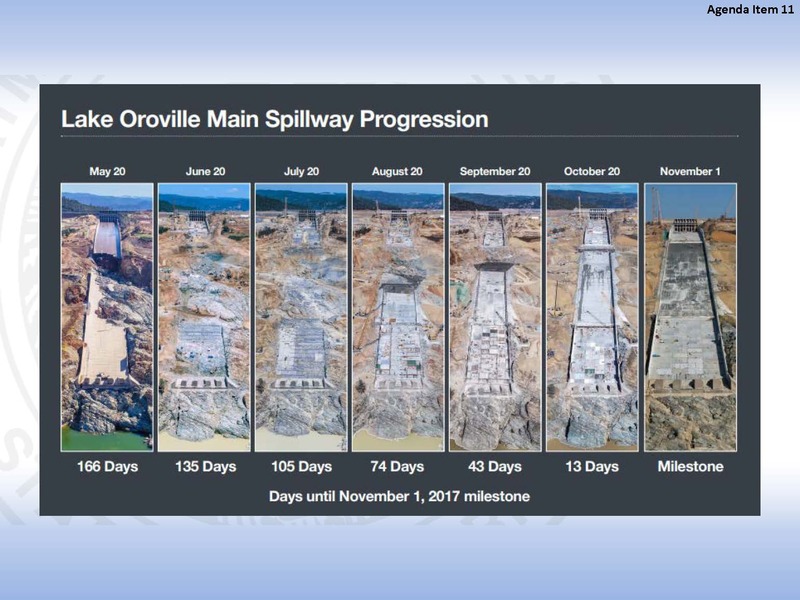 Mr. Leahigh presented a photo sequence showing the progression of construction on the spillway at Oroville, noting that Kiewit Construction worked close to around the clock to complete what would normally be years of work in just over 5 months to get a somewhat functional spillway back in place. 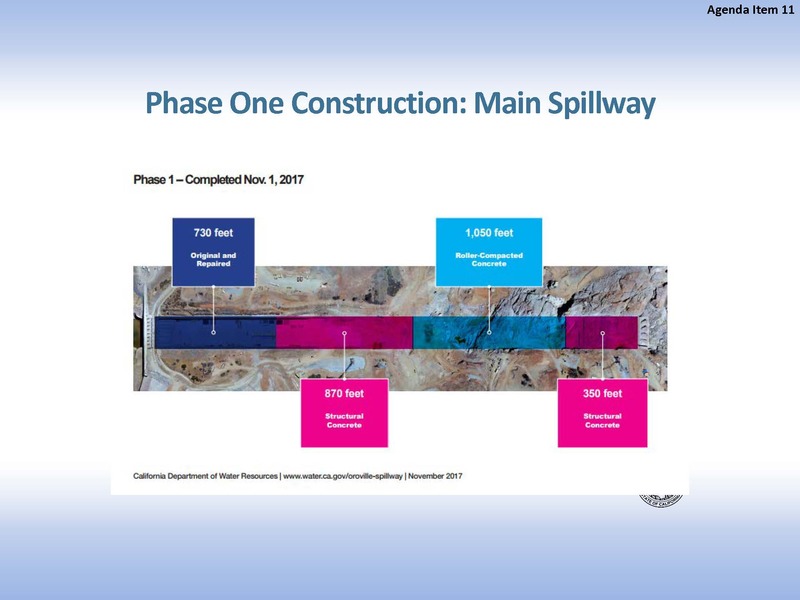 As a result of only having partial capacity, they had to operate Lake Oroville more conservatively, he said, presenting a slide showing the operations plan and with the dark blue line being the actual storage as they went through the year. 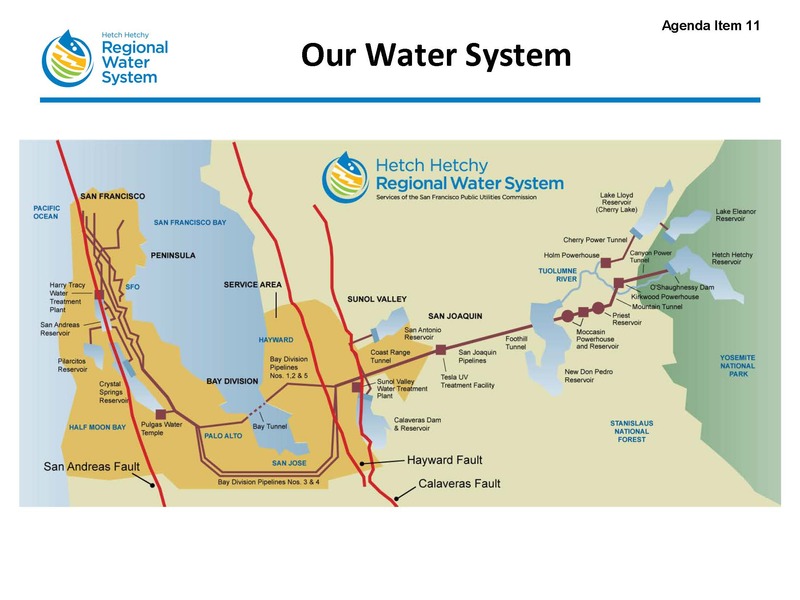 Steven Ricthie began by discussing the Hetch Hetchy regional water system, noting that it spans the width of California. 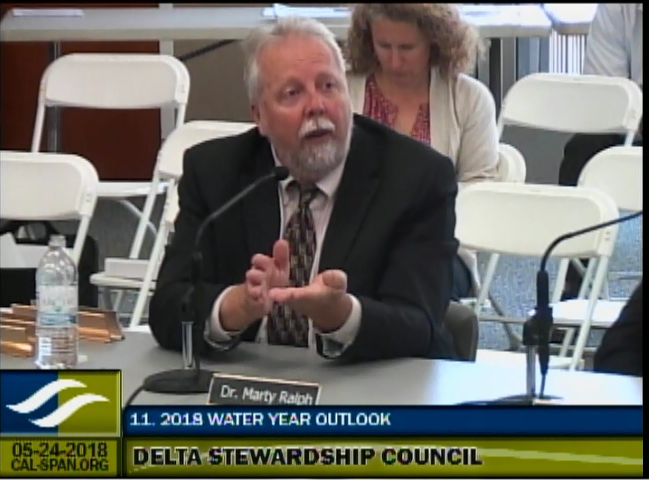 At the top of the system, there are three Sierra reservoirs, there are two reservoirs in Alameda County, and three reservoirs in San Mateo County; he said it is those 8 reservoirs that really drive the water supply for the San Francisco system. 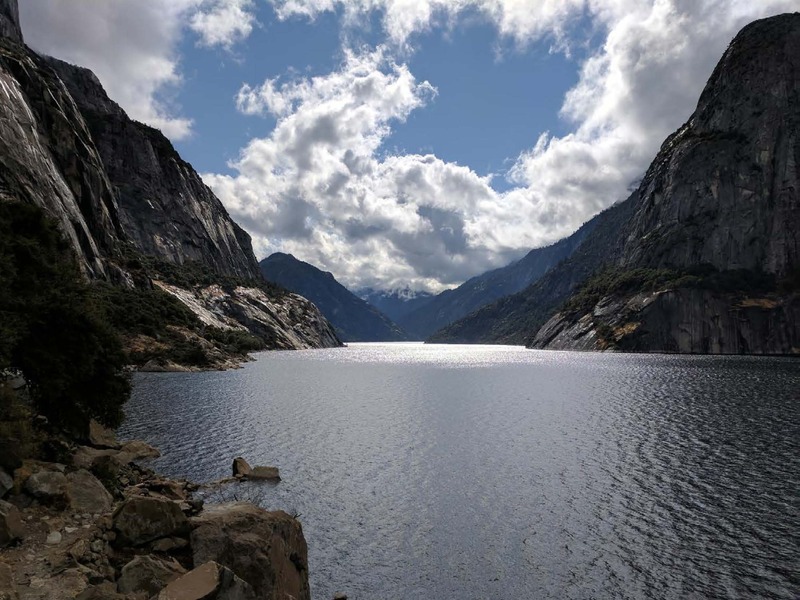 The Hetch Hetchy system serves 2.7 million people; about 1/3 of the water is delivered to San Francisco, and 2/3 of the water is delivered to the 26 customers that are in San Mateo County and Northern Santa Clara County. He presented a schematic of the water system, noting that the maroon square boxes on the right are the three hydroelectric powerhouses and the red circles are the two regulating reservoirs, Priest Reservoir and downstream of that, Moccasin Reservoir. There is a tunnel and pipelines that take the water under Don Pedro Reservoir; Mr. Ritchie noted that they are not connected to Don Pedro Reservoir by plumbing, but they are through the Tuolumne River. The Hetch Hetchy system then crosses the Central Valley through a set of pipelines to the Alameda County reservoirs; it then enters the Bay Area, going around and under the bay and coming up the peninsula. The three bright red lines are the earthquake faults the aqueducts cross. He noted they were close to the end of a $4.8 billion capital improvement program that was aimed largely at seismic reliability. Mr. Ritchie presented a diagram showing the cumulative precipitation over the year. He said although it wasn’t a ‘Miracle March’, it was a ‘Magnificent March’ with the highest precipitation level at Hetch Hetchy for March in their 100 year hydrologic history, which brought the precipitation up to just about median level. 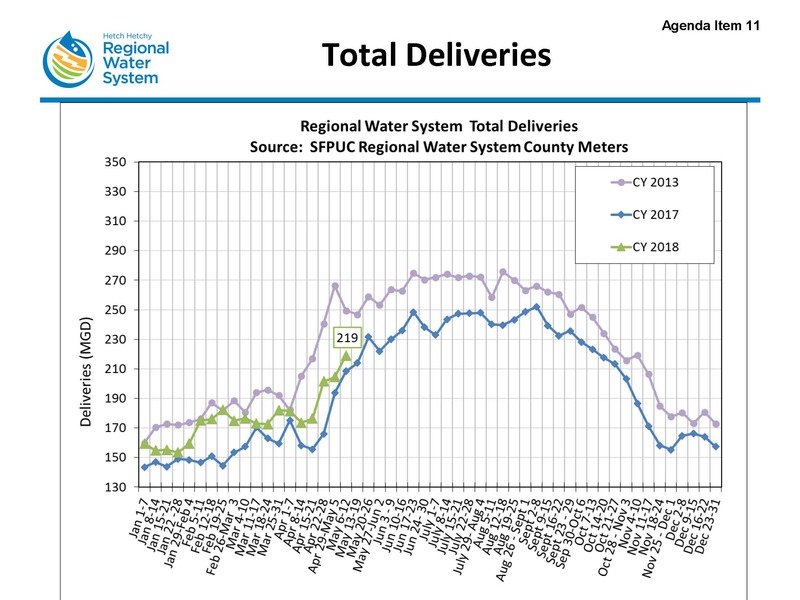 He presented a chart showing total system deliveries over the course of a year, noting that the demands are lower in the early part of the year, peak during the summer, and drop off later in the year. 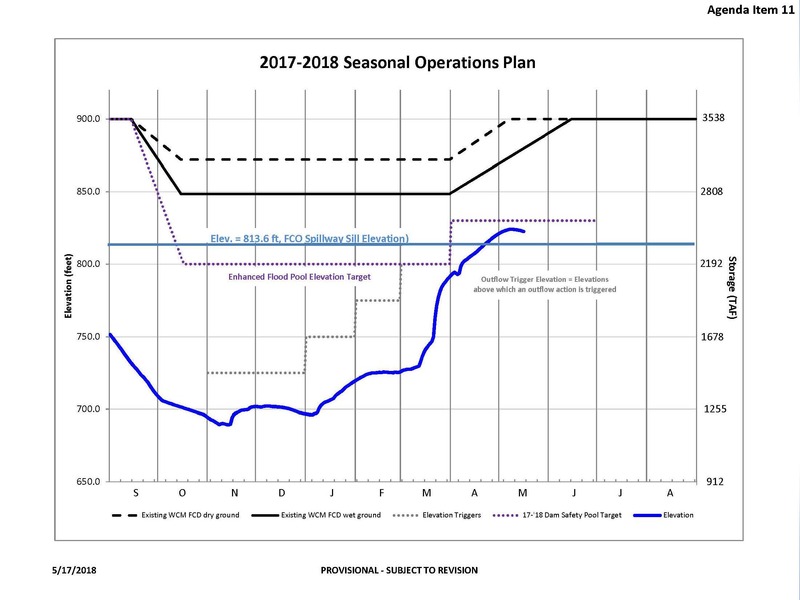 The purple line is demands fro 2013, the last pre-drought year; the blue year is last year, 2017 demand; and the green is 2018. 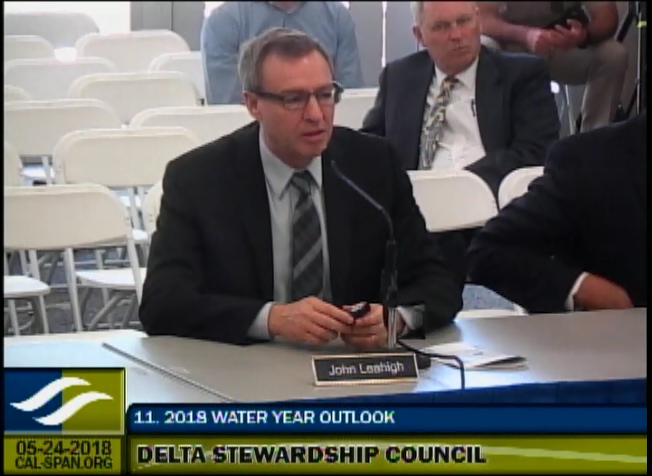 He noted that in recent years, they are starting to see demand rebound in the service area, noting that in 2015, there was no summertime peak as there was no outdoor irrigation at the height of the drought. “We’re starting to rebound back up but we’re still substantially below 2013 demand levels,” he said. On March 22, there was 5” of precipitation in one day measured at Priest Reservoir, the regulating reservoir above Moccasin reservoir; 5” in a day is not unusual, but what was unusual is was that 3” of rain came down in four hours, he said. 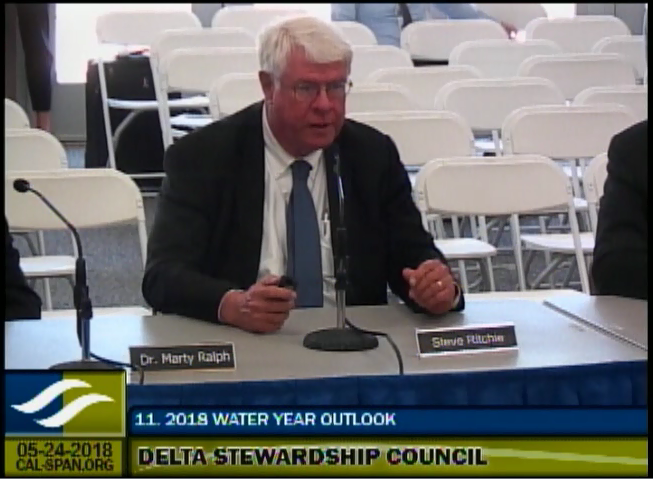 There is a diversion dam above Moccasin Reservoir that diverts the local runoff around the aqueduct to keep the Hetch Hetchy water clean; the streamflow in Moccasin Creek was 16,000 cfs, which is unheard of, he said. 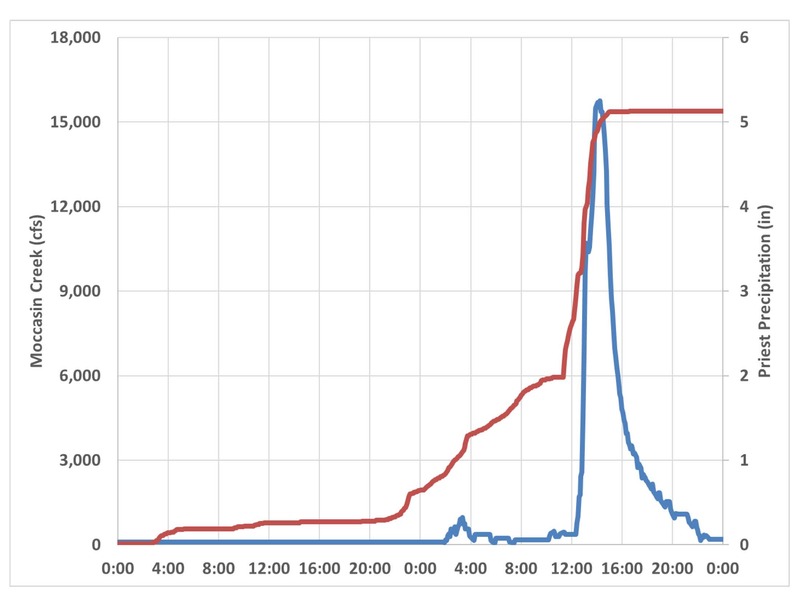 He presented a graph, noting that the red line is the precipitation measured at Priest Reservoir; it started off slow around midnight and picked up in the morning, which was enough to get the ground basically saturated. Then the 3” in four hours started, and the blue line, representing the streamflow in Moccasin Creek, shot from probably about 100 cfs to 16,000 cfs in a matter of about two hours. “It was a pretty monumental flash flood that we were experiencing,” he said. He presented a slide showing two pictures of Moccasin Reservoir. 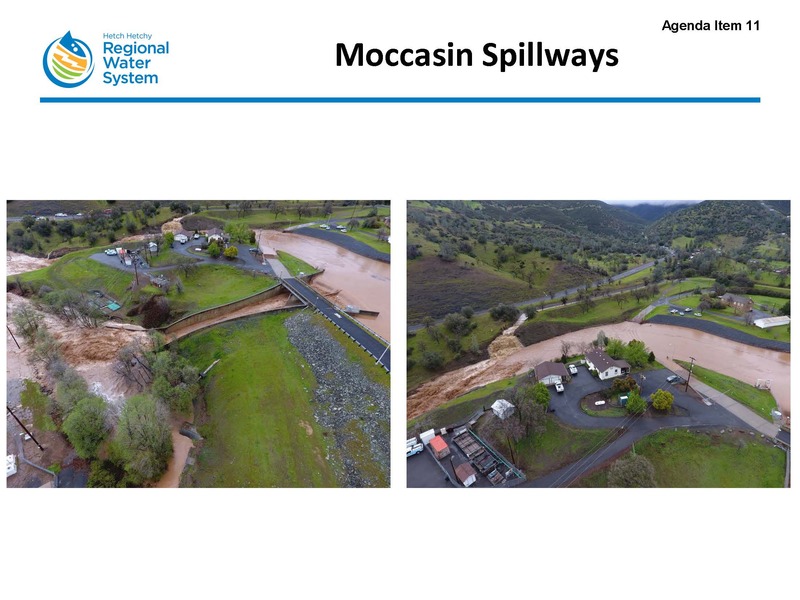 The picture on the left shows the normal spillway, which is running pretty full, and off to the left, the creek has jumped the banks and the Moccasin Creek fish hatchery was washed out. The fish were either killed or washed out down to Don Pedro; the remaining fish were salvaged and taken down to Don Pedro because the fish hatchery was basically out of operation. So for the Hetch Hetchy system, 2018 was a good water year; there system will fill. Every July 1st it starts over again. Dr. Marty Ralph began by noting that the project name is Forecast Informed Reservoir Operations (or FIRO) and it was inspired by a project that DWR had a lot to do with that investigated forecasting coordinated operations for Oroville and New Bullards Bar; it was a project that really broke some new ground in bringing in forecast information into decision making and reservoir operations. During the recent drought, Dr. Ralph attended a meeting with the folks up in Sonoma County about their reservoir. Secretary John Laird had been to the Coyote Valley Dam and had remarked how low the reservoir level was; there was a storm that had hit the year below where a lot of water had been released mid-winter. The question was why did that water get released and is there anything different that could be done? 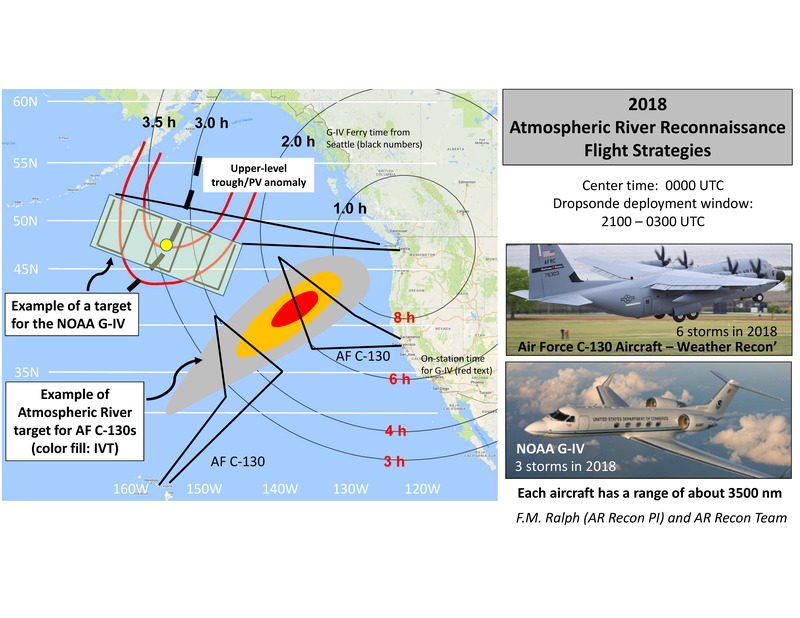 That triggered a grass roots effort to do a study, now that they are getting better at forecasting storms, to look at the possibility of incorporating forecasts of atmospheric rivers into reservoir operations. The Sonoma County Water Agency provides water to about 600,000 people as well as a grapevine/wine industry. 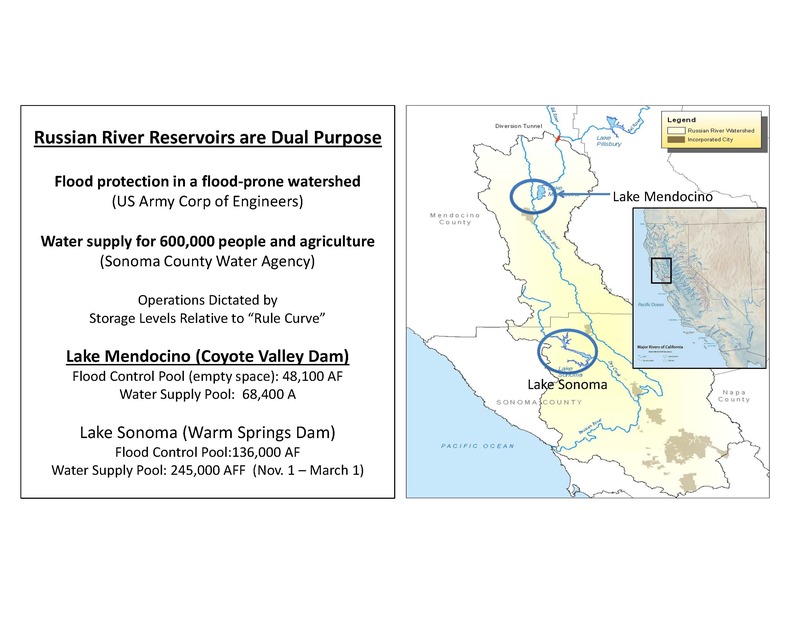 There are two major reservoirs, the Coyote Valley Dam that forms Lake Mendocino, and the Warm Springs Dam, which forms Lake Sonoma. Another challenge for this watershed faces are the endangered salmon which have a biological opinion in place to try to restore their numbers. “Lake Mendocino, like much of California, went from the worst drought on record in some ways to the wettest year on record within a year or two, which seems to be the nature of things here,” said Dr. Ralph. 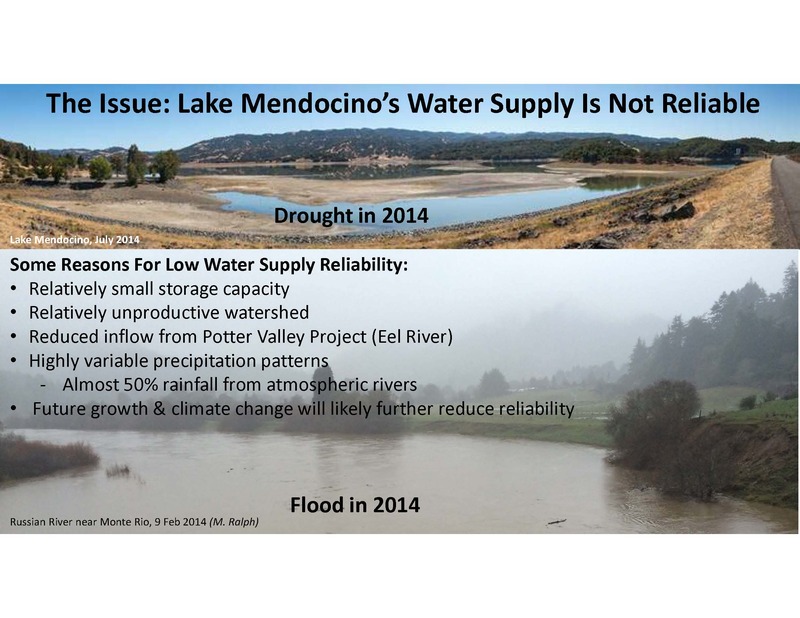 He presented a photo of that reservoir in 2014, noting that some of the reasons for the low water supply reliability in the area are that storage capacity is relatively small compared to demand; the watershed itself from a hydrology standpoint is a bit inland and gets a little bit rainshadowed; there’s reduced inflow from the Potter Valley Project as there was biological decision to keep more water in the Eel River and that reduced the inflows into Lake Mendocino by about 70,000 acre-feet or so; and variable precipitation patterns, some of the most variable in all of California. Mr. Ralph then stepped through the situation a few years ago when the reservoir was so low. 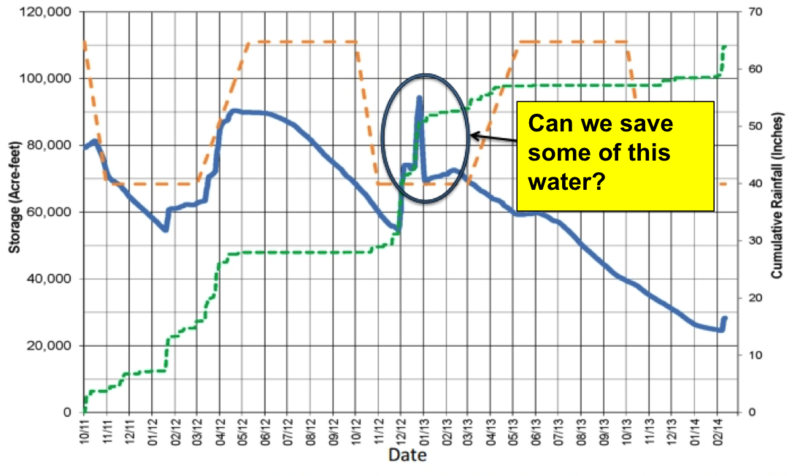 He presented a graph of the storage on Lake Mendocino, noting that the blue line is the reservoir level, the green line is the precipitation, and the gold line is the amount of water the reservoir is supposed to have in it. He pointed out how the green line takes big jumps up and then is sort of flat for awhile; those big jumps are the atmospheric river storms. It’s partly empty of course as in the winter there’s a need for flood control, he said. 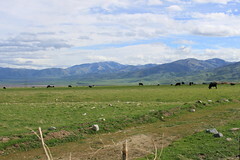 The project was an ad hoc effort between the Center for Western Weather and Water Extremes, DWR, the Army Corps, USGS, and the Bureau of Reclamation. They had terms of reference, but it wasn’t a legal document; it was more of a shaking hands and committing to integrity and good work together, he said. They set goals, one of them being to determine if it was feasible or viable to temporarily keep 10,000 acre-feet of water in the case of that 2012 event and safely be able to release it if a storm was predicted. Is the forecast good enough, are the facilities capable of handling that, and what are the risks involved with that> They developed a 5-year plan and a major technical effort to pursue the study. The study is now looking at two steps: First, what would be the potential gains if forecasts could be improved as we have some very serious opportunities to improve forecasts to the point that greater benefits would emerge, and secondly, what would happen if we ended up in a flood year? 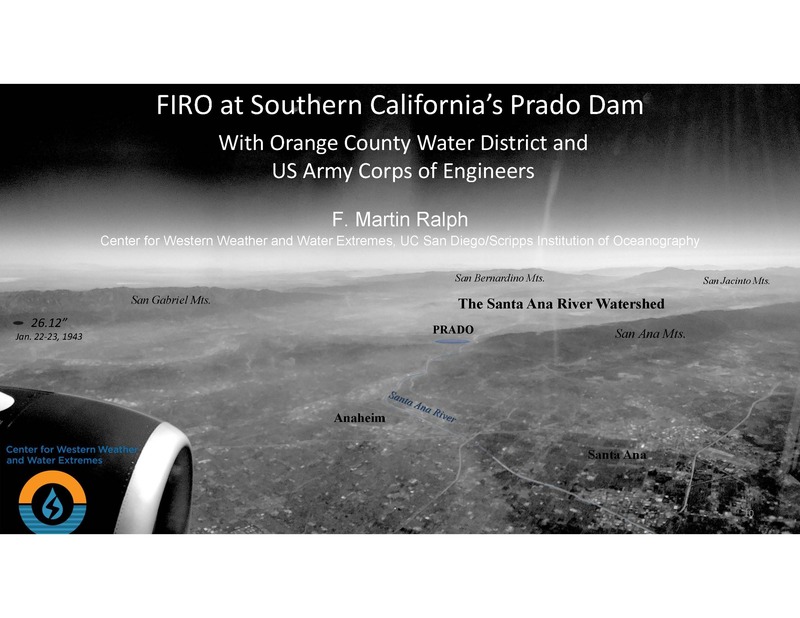 Dr. Ralph said they are exploring the transferability of the process and evaluating the viability to another reservoir jointly with Orange County Water District for Prado Dam in the Los Angeles Basin. “Orange County has been very strong at working with this, the Army Corps of Engineers is involved again, and we started another steering committee for that reservoir,” he said. There are reasons for this error, one being that the storms move from over the ocean to onshore, and the weather prediction system doesn’t have as much data in it to make the forecasts as good as they should be over the ocean, he said. Vice Chair Susan Tatayon asks about developing a Moccasin Dam scenario. 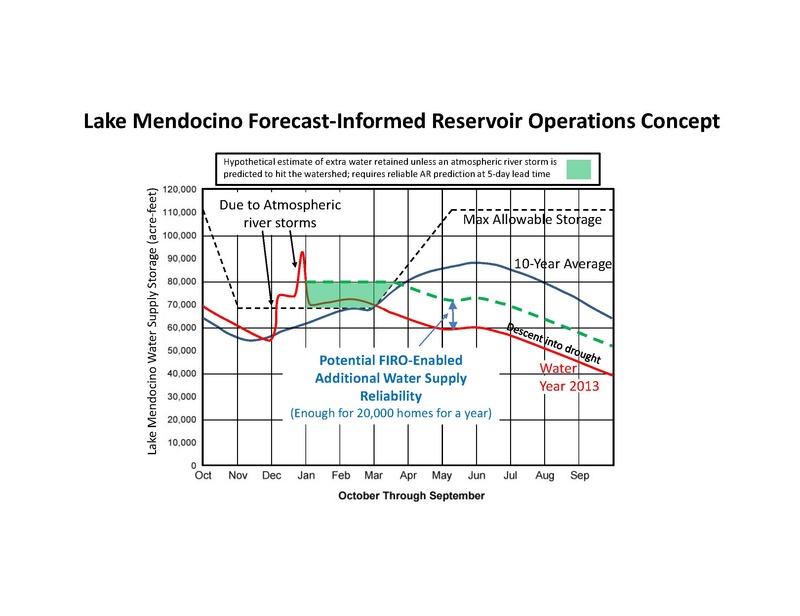 Councilmember Ken Weinberg asks how forecast informed reservoir operations relate to critically overdrafted groundwater basins. Is there a way to make conjunctive use work? 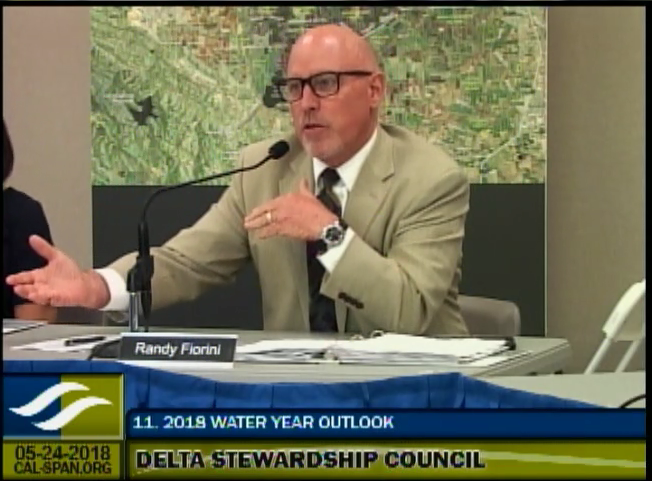 Chair Randy Fiorini then asked what the lessons learned from the recent 5-year drought has impacted the current decisions of the amount of water to allocate for this year. 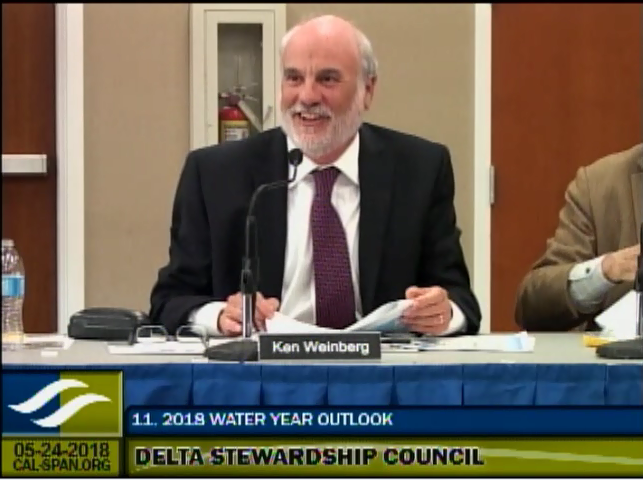 For the full agenda and meeting materials for the April meeting of the Delta Stewardship Council, click here. To watch this meeting on webcast, click here.